Humboldt's influential comparative elevation chart. Physical Geography. Humboldt’s Distribution of Plants in Equinoctial America, According to Elevation Above the Level of the Sea. 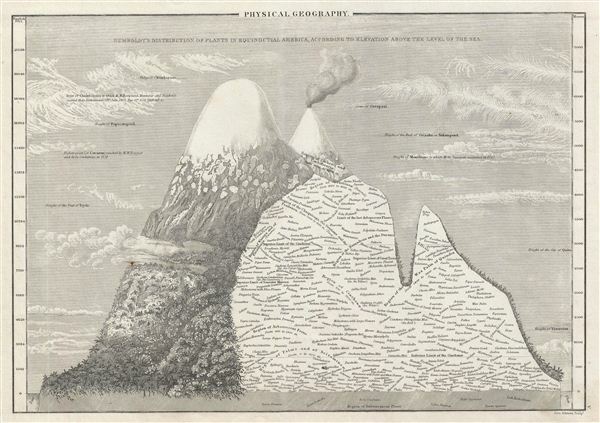 This is Adam and Charles Black's rare 1840 profile view of the Andes Mountains, particularly Ecuador's Mt. Chimborazo, based upon an influential 1805 illustration by the renowned German explorer and scientist Alexander von Humboldt. Among the first scientists to take Kant's philosophy of Transcendental Idealism into the scientific field, Alexander von Humboldt, to illustrate discovers made on his ascent (the first) of Mt. Chimborazo. Humboldt, as a well-educated German nobleman, was heavily indoctrinated into the philosophy of Immanuel Kant. During his epic journey into South America, Humboldt used illustrative techniques to catalog, define, and reason through the scientific data he collected. His published work is full of illustrations, maps, and charts, many of which were incredibly influential. In our case, we must focus on Humboldt's profile of the Andes 'Geographic der Pflanzen in den Tropenlandern, ein Naturgemalde der Anden.' Humboldt's 1805 chart, is not strictly speaking a comparative mountains and rivers chart, however, it was extremely influential with regard to the development of the genre and is one of the earliest examples of a 'more formal and scientific means of expressing the vertical dimension.' With this chart, Humboldt was attempting to illustrate his research and experience in climbing Ecuador's Mt. Chimborazo. At the time Chimborazo was considered to be one of the world's tallest mountains and indeed, though dwarfed by Everest, Chimborazo may still be considered the tallest mountain in the world if measured from the center of the earth. Humboldt's ascent of Chimborazo was a significant accomplishment, not only because he reached an unprecedented altitude, but also for the detailed scientific observations he took along the way. Possibly influenced by the mountain profile diagrams he worked with as a mining engineer in Germany, Humboldt commissioned a Viennese landscape painter to assemble this chart according to his specific instructions. The chart compares and contrasts vegetation and mineral composition, noting tree and snow lines, rock forms, and even some subterranean elements. While only Chimborazo is specifically drawn in profile, Humboldt sets the stage for future development of the comparative mountains genre by textually noting the elevations of several other well-known mountains, including Popocatepetl, Mont Blanc, Vesuvius, and Orizaba, as well as the elevation of Quito and the highest point reached by Condamine. Prepared by Adam and Charles Black for issue in the 1840 issue of their Black's General Altas. Alexander von Humboldt (September 14, 1769 - May 6, 1859), whose full birth name is Friedrich Wilhelm Heinrich Alexander Freiherr von Humboldt was a German born naturalist, biologist, geologist, explorer and cartographer active in the late 18th and first half of the 19th century. The importance and scope of Humboldt's work is staggering and its influence on both the development of America and the development of science itself is second to none. As Emil Du Bois-Reymond said, "Every scientist is a descendant of Humboldt. We are all his family." To compose a full biography of Humboldt is the work of volumes, not this simple medium, so we will attempt to focus on the highlights of Humboldt's life as it pertains to cartography. Humboldt was the first scientist to embrace and actually take into the field the Kantian concept of a union between careful scientific observation and intuitive analysis. Between 1799 and 1804 Humboldt traveled through northwestern South America, Central America, Mexico, and parts of the United States. During this voyage he collected a wealth scientific observations and measurements, including considerable surveying and cartographic work, in each of the regions through which he passed. Humboldt's mapping of Mexico, then inclusive of much of the southwestern part of the United States, was an accomplishment of seminal importance, not only because it was the finest map of the region yet produced, but also because of its impact on the future political geography of the Americas. Upon his arrival in Washington, Humboldt struck up a friendship with president Thomas Jefferson, soon to be president James Madison, and other luminaries of post Colonial America. He freely shared his mappings of Mexico with the U.S. President, little suspecting that they would soon influence the results of the Mexican American War and the manifest destiny movement that would follow. When he returned to Germany, Humboldt began a life-long correspondence with scientific luminaries and explorers throughout the world and most particularly in America. Humboldt's influence can be directly tagged to the development of numerous important careers in American cartography, including those of Nicolette, Fremont, Wilkes, Hassler, Bache, and others. Though Humboldt never again visited America, his name is etched across our landscape through numerous Mountains, Rivers, Islands, and other geological features that bear his name. Had the votes in Congress swayed slightly to the other direction, even the entire state of Nevada would have been the state of Humboldt. Throughout his life, Humboldt was a tireless supporter of human equality, scientific advancement, and personal liberty. Humboldt died in Berlin at 89 years old, in his long life he was an inspiration to the invention of modern anthropology, the political destiny of South America, the geographical exploration of the American West, and, ultimately, the development of modern science. Hall, Sydney, Black's General Atlas: A series of Fifty-Four Maps from teh Latest and Most Authentic Sources, Engraved on Steel, In the First Style of the Art, (Edinburgh: Adam and Charles Black) 1840. Rumsey 2305.009 (1854 edition). Philips (atlases) 4334.